"Chasing the dragon" involves placing heroin over aluminum foil, heating it with a lighter, and inhaling or vaping its fumes through a straw or tube. 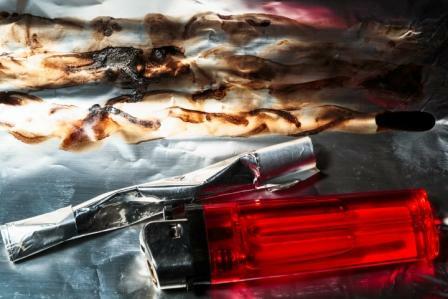 According to a review published in JAMA Neurology, an increasingly popular method of heroin inhalation known among drug users as “chasing the dragon” can lead to “peculiar and often catastrophic brain complications.”1 Chasing the dragon involves placing heroin over aluminum foil, heating it with a lighter, and inhaling or “vaping” its fumes through a straw or tube. The research team, led by Vilakshan Alambyan, MD, from the Department of Neurology at Case Western Reserve University, Ohio, noted in the review that the practice is growing in popularity and reaching near-epidemic proportions in states west of the Mississippi and in urban centers. “Our work was to investigate the role of inhaled heroin, and specifically chasing the dragon, in the ongoing opioid epidemic,” commented review coauthor Ciro Ramos-Estebanez, MD, PhD, in an interview with Clinical Pain Advisor. “Chasing the dragon damages the brain’s white matter to a degree that eventually leads the affected tissue, when seen under the microscope, to look like a sponge, with irregular holes throughout. Historically, many different toxins have been implicated in the development of this clinical picture. A second look at the available evidence has led us to hypothesize that it is heroin itself which causes this peculiar pattern of brain injury. We suspect that heroin inhaled via chasing the dragon hurts the brain through a mechanism quite distinct from other routes, and we elaborate on a putative mechanism.” In addition to summarizing the results of a literature review and additional case studies pertinent to the pharmacology, pathophysiology, clinical spectrum, neuroimaging, and neuropathology of the condition they call “CTD leukoencephalopathy,” the investigators provided a “good practice statement,” with proposed diagnostic criteria and recommendations for therapy.